This anthology is a souvenir of the 2011 UK Meet, an occasion for GLBTQ supporters to get together in a relaxed setting to celebrate and chat about the fiction community they love. Funds from the sale of this anthology will go towards future UK Meets, to which all are welcome. Oh, my, this is what happens when the constraints of American publishers, American-speak, and standard romance conventions are released. 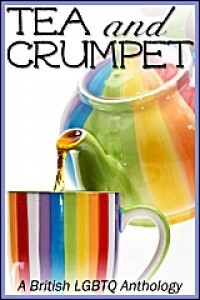 Tea and Crumpet is a charming collection of short stories from British authors in all their native glory. More than half of the authors here are new to me, with a wide variety of style and voice. There are eighteen stories that span most of the social spectrum, though if I wasn't quite sure what a "chav" is, I could glean a lot from context. And from Google – who wouldn't want to know more about something called "Insanely Bad Elf"*? Most are m/m, a few f/f – and while the f/f stories did not stand out as distinctly in voice, the diversity was welcome. With this many stories, I'm not going to go into each in detail or we'll be here for 100 pages, so I'll mention a few of the standouts, though please understand, the entire collection is worth the read, particularly if you yearn for a gay story that doesn't adhere completely to the HEA/HFN model. JL Merrow provides another one of her humorous shorts with Good Breeding. Giles finds himself confronting all his snobbery when he discovers that his own antecedents aren't as posh as he could wish when he tracks down his birth mother. Between his even snobbier boyfriend Hugh and his level-headed roommate Oz, Giles gets an attitude adjustment and a lesson in priorities. Funny, with a little sting. The Utterly True History of Guy Alien and the Rise and Fall of His Band, X-Wing is one of the non-standard-romance stories, though Stevie Carroll reveals the relationships and the caring. Part is a magazine exposé, part the reactions of the readers, it lets the identities of the readers unveil slowly, and by the end, you'll be utterly content with the lovers. A follow-up to another story I now feel compelled to track down, We’ll Always Have Brighton #2 from Zahra Owens stands alone, both as narrative and in voice. Told from "I" to "you", you being the other member of the couple, this is a structure I've seen only once before. It works well in this tale of recovery from a terrible incident. Names are neither given nor needed; the whole universe is this couple and a place that means a great deal to them. *Insanely Bad Elf is an imperial red ale with an ethanol content designed to remove paint. But I will not tell you how it fits into the story. Thanks for the fantastic review, Cryselle! Oh! I have that! Need to move it up the TBR list. You know that problem, so many books, so little time. You are welcome, and I bet you had a wonderful time at the UK meet.